AMERICA/ ARGENTINA - The Bishops of the Cordoba region: "Let us joyfully live the grace of beatification"
Cordoba (Agenzia Fides) - "As has happened so many times in the history of the Church, Providence has united Bishops, laymen and consecrated men in martyrdom. It is the grace that comes from God and is for everyone. It illuminates the heart, invites to conversion and rekindles the fire of evangelizing passion. Therefore, we would like to urge every baptized person and our communities to live intensely the grace of this beatification that will take place on Saturday, April 27th, in the city of La Rioja". This is what the Bishops of the Ecclesiastical Region of Cordoba write in their message entitled "We joyfully live the grace of beatification" published on 27 February, at the end of their annual meeting held at Villa Cura Brochero. "From the gaze on the life of our diocesan Churches that we shared - the Bishops write -, we want to highlight a grace of God for his people: the imminent beatification of Bishop Enrique Angelelli, priests Gabriel Longueville and Carlos Murias, and layman Wenceslao Pedernera. Two of them (Angelelli and Murias), are children of this Cordobesa land. Their blood was shed for fidelity to the Gospel. In the midst of one of the darkest nights in the life of our Country, the love of Christ led them to be together with the poorest. They chose to be brothers when some preferred to become enemies". "Their love for the poor and their identification with the humiliated, patient and meek Christ, amid a growing spiral of violence, constitutes an eloquent message to live today our faith and responsibility in the construction of society". The message ends by invoking the Immaculate, the Holy Cura Brochero and the future blessed martyrs in order to continue "to animate and inspire the journey of our Churches with their closeness". The document is signed by the Archbishop of Córdoba, Carlos José Ñáñez; by the auxiliary Bishops, Pedro Torres and Ricardo Seirutti; by the Bishop of Río Cuarto, Adolfo Uriona FDP; by the Bishop of Villa Maria, Samuel Jofré; by the Bishop of San Francisco, Sergio Buenanueva; by the prelate Bishop of Deán Funes, Gustavo Zurbriggen, and by that of Cruz del Eje, Ricardo Araya. 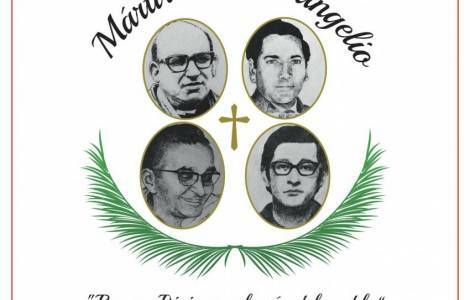 2019 - The Bishops of the Cordoba region: "Let us joyfully live the grace of beatification"
2019 - Presentation of the logo for the beatification of the martyrs of La Rioja, "the joy of the whole people"